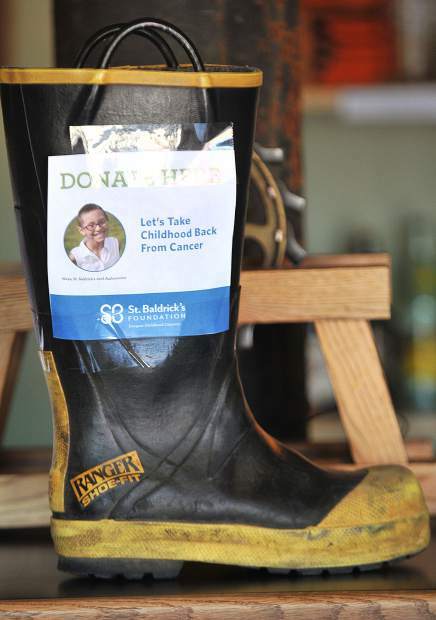 Firefighter boots sit on the counters of Ol' Republic Brewery during Saturday's Brave the Shave event to end childhood cancer. 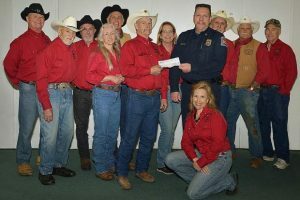 About $13,000 was raised during the event from donations. 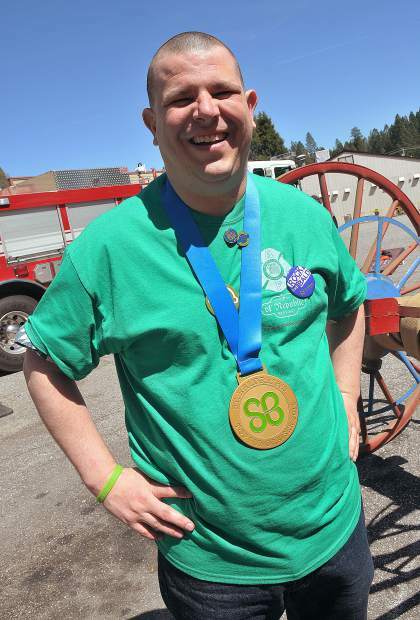 Sean Painter smiles as he wears a gold St. Baldricks medal, awarded to him for being the highest single fundraiser, bringing in $2,200 to have his head shaved. 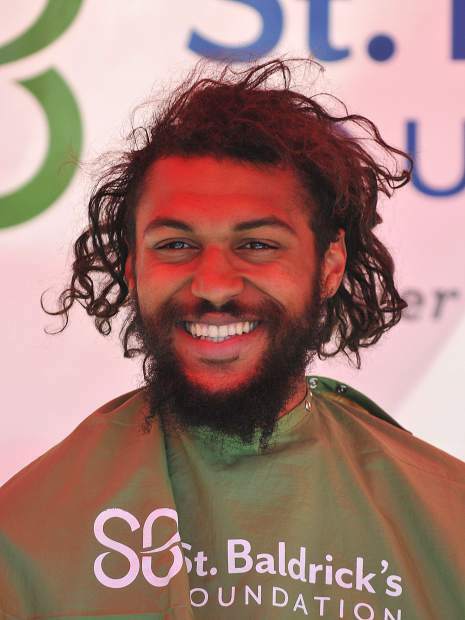 David Cochran smiles before getting his locks cut to benefit the St. Baldricks Brave the Shave event Saturday at ol' Republic Brewery in Nevada City. Walter Mainguth, 7, smiles at his friend Louie Forrette, 8, took time to get their heads shaved during the Brave the Shave St. Baldricks event to help end childhood cancer. The event was Saturday in front of the ol' Republic Brewery. Around $13,000 was raised with 41 participating. Nevada County Firefighter Dillon Weitzel gets the last of his hair cut by one of a handful of barbers and stylists that donated their time for Saturday's head shaving event. 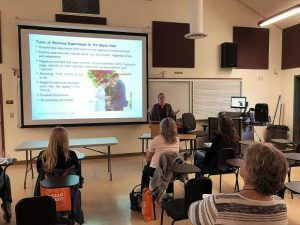 Volunteers included Todd Frei from Todd's in Grass Valley, Arch Owens from Tomahawkers, as well as Samantha and Demetri from Lux salon in Auburn. 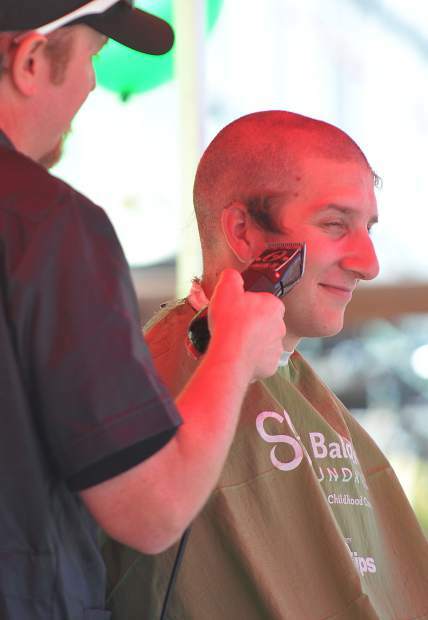 Nevada County Local 3800 Firefighters joined forces with the St. Baldricks organization once again to help raise money to end childhood cancer with the annual Brave the Shave event held Saturday at the ol’ Republic Brewery in Nevada City. “It feels weird,” a young Walter Mainguth said after losing a full head of hair to the clippers. 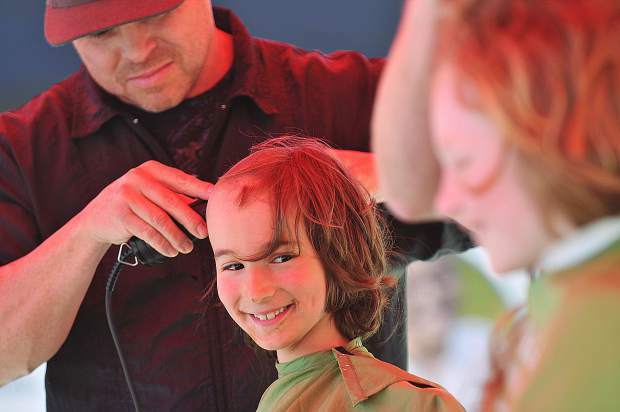 Mainguth, 7, ran his hand over his bald head and smiled to friend, 8-year-old Louie Forrette, who had also just had his head shaved. The two were part of a group of 41 people who volunteered to have their heads shaved during the event. A total of $13,000 was raised by the shavees and other donors. 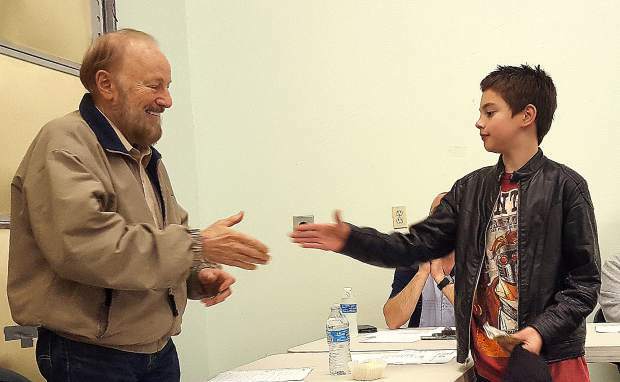 Volunteers from area barbershops and salons, including Todd’s in Grass Valley, Tomahawkers, and Lux Salon from Auburn, helped shave the participants from 1 to 5 p.m. while volunteers from Food Bank of Nevada County grilled free hamburgers and hot dogs for participants. Fire engines from various western Nevada County locations were on display for kids and kids at heart to enjoy.